Click here to download TabIt! TabIt is a full-featured program for creating, playing, and printing guitar, bass, or banjo tablature. Playback: Enter tablature, then play it back through your computer speakers. 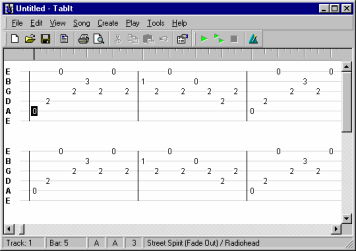 Multiple tracks: Tabs can have up to 15 different instruments (chosen from a list of 128) playing simultaneously. Drum tracks: Augment your tabs with up to 47 different drums. Text file export: Convert your tabs into plain text files. MIDI file export: Convert your tabs into standard MIDI files, suitable for playing or editing in other programs. A large selection of tablature transcribed by the TabIt community is available for download on our site, which can be viewed and played using TabIt. Copyright © 1996-2010 GTAB Software. All rights reserved.